The most amazing display of fireworks I have ever witnessed was on the Halifax pier in celebration of Canada Day almost 20 years ago. I stood shoulder to shoulder in a standing room only crowd as the fireworks exploded over our heads, perfectly synchronized to the orchestra music that poured out of huge speakers. The colors and choreography were awe-striking. I.absolutely.love…large firework shows. Fireworks and The Fourth of July was undoubtedly the last formal holiday I was willing to examine from a holistic and natural health perspective. By then I had already made my way through well-established traditions for birthdays, Christmas, Easter, Halloween, Thanksgiving, Valentine’s Day and even New Years. The thought of researching and limiting yet one more thing my family looked forward to was much less than appealing. And well, quite frankly, I figured….how bad could it be? It’s a day just like every other – plus some fireworks. We ate the same (except for maybe some extra treats than we normally do), hung out with friends or family, and that was about it. It took two, maybe three years, before I began to piece together the effects that fireworks have on the canary kid in my home. And these realizations always lead me to digging a little deeper and wondering how the rest of us are being affected in a not-as-obvious way. What’s the problem with fireworks? Well, to state the obvious first…they are dangerous. Backyard fireworks cause fires, property damage, and send people and pets to the hospital from injury in numbers that keep the sirens going almost all night long in the city. This becomes more real when it happens to someone you know. Large scale fireworks are a little safer, as those are done with regulation, with firemen on the scene already, and usually with people trained to set them off in special attire. Things can still go wrong, and this includes having debris blow the wrong direction. I remember watching a fireworks celebration as a child and the wind blowing large pieces of burning ash into the stands where we all sat. The ground waste is harmful to animals and people. Anyone with a cat, dog, or farm animal cringes at the knowledge that firework explosions will mean trying to also shelter animals from the loud noises that cause them panic. Years ago my brother’s bull mastiff went entirely through their laundry room door due to Fourth of July fireworks. However, one lesser known concern is that the debris left from fireworks can cause organ failure if ingested by a dog passing by or a cat that gets nanoparticles in an outside water dish. There are also situations where people – special needs adults and children – have picked up and eaten packaging or ash, or licked the ones they held in their hands. Poison control gets a lot of calls for this, and sometimes they end in an emergency room visit. Fireworks are a nanohazard. They pollute the air, and in turn, also then pollute our bodies and our lungs. I used to think it was just all the smoke that caused the issues we dealt with. It wasn’t until I got to googling and learning about how fireworks are made that I discovered that the coloring and explosive agents put additional toxins into the air. 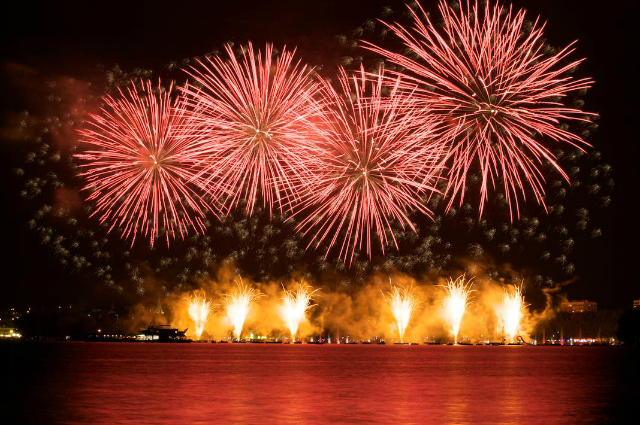 Fireworks use metal salts to create the colors, and these colors come from forms of aluminum, bromide, arsenic, copper, lead, and mercury, just to name a few. These metals, along with other pollutants such as nitric oxide, then get released into the air and the environment for us to breathe. These tiny metal particles are so small that they travel deep into the actual lungs. Sparklers specifically release huge amounts of nanoparticles within close range that are then inhaled and land on the skin. These are not regulated, and contain barium. Backyard fireworks known as ‘snakes’ contain aluminum. Potassium, aluminum, and chlorine compounds are used to propel the fireworks into the air. And as if that wasn’t enough, fireworks also contain a dextrin binder which is made from starch. That means all that smoke-filled air is giving you a hefty dose of airborne CORN! Ugh. My total NOT favorite. The noise is a horrible sensory trigger, and can be enough to cause some real grief for those who are really sensitive to sound. The number of children with sensory issues is well on the rise, and multiplies tremendously each year. I am not referring to just autism – though sensory issues certainly are characteristic of a child or adult on the spectrum. I am referring to children (and adults) who have difficulty with sounds and becomming over stimulated to the point of major anxiety. Street shows of fireworks lasting well into the evening do more than disrupt sleep, but cause parents to drag high needs kids out of the house in an effort to find a place they can keep them calm and free from the booming. For those of you who do struggle with this, I highly recommend investing in a set of noise cancelling headphones such as THESE. They are fantastic to have on hand. The light is a seizure trigger. If you have a child whose seizures are triggered by light, then you spend the weeks surrounding the 4th of July shrouded in anxiety. People do not reserve their celebration for the actual 4th, regardless of what the law says. That means that every night for days before and after those curtains must be pulled tight to block out the flashes, and any cause for leaving the house from dusk until morning is a frightful concern. Realize that the effects of fireworks last before and after the actual holiday. We start noticing a change in toxic load at the same time the neighborhood fireworks illegally begin – a couple weeks prior to the actual 4th. The pollution in the air begins almost 3 weeks of hunkering down while battling air quality and the inhalation of toxins in the air. However your child, or adult loved one, shows that they are struggling with toxins will begin whenever the fireworks actually start, and that may be well before the actual holiday. The air quality, sounds and flashes will affect everyone, not just those who are knowingly sensitive. Be aware of behavior changes, anxiety increases, and individual struggles for everyone from the infant to the grandma. The stress of the holiday celebrations combined with the less than ideal air is going to affect everyone, even if its much less noticeable. This is a good time to focus on fun and extending grace to everyone – even in the community around you. What does my family do on Independence Day? We get out of town. We head to the country where we have a family gathering that includes games, activities, lots of eating, and just plain hanging out. If we did not do that we would find a secluded spot somewhere near the beach or in the hills to spend the night- camping, glamping, or hoteling. Sometimes we watch a large firework production from far away, free of direct smoke and debris but where we can still see the show. If you are dealing with a special needs family, just know that these adjustments become easier as time goes on. And I admit that in the early days we did not always make the right choice. I would do my best to buffer the effects so that we could still participate in many of our established traditions. The result was some serious stress that kept me from enjoying the day, and some serious guilt afterwards while dealing with physically sick and emotionally sick kids. It took me a few years to figure out that it wasn’t worth it and that I was not really providing a good example for my girls. I have also learned that the number one ingredient to having fun and celebrating any holiday is making sure everyone is safe, and that we are all together. That’s it. Period. The fun of watching a round of fireworks in the street does not outweigh the emotional and physical illness that comes as a result on the day after. That’s not teaching our kids that we protect them, value them, and that their needs come first. And regardless of age, everyone deserves to feel valued and included. That is so much more important, and has given us the freedom to be less bound by tradition and more open to new adventures. I am a big fan of new adventures. Thank you for this. I appreciate the beauty of fireworks, but all the noice, fire danger, and pollution make it impossible for me to enjoy them anymore. I’m more than willing to give them up; I just wish the majority in my town felt the same way.